I’m going to just go ahead and embrace the roiling darkness and present, for your consideration, my own chronicle of our downward spiral. Not counting the French war on religious freedom, American attacks on the 2nd Amendment, Don Lemon’s career, and a host of other blemishes we don’t have room for. Did I mention **** this year? While I don’t think this was my finest writing by any means, I do think it’s one of the more important posts I wrote this year. And not just because I want my good name vindicated by future historians or alien archaeologists sifting through the ashy remains of the Western hemisphere. In the face of a lot of folks trying to come to terms with the election of Donald Trump, I make the argument that they just don’t have to. These “protest” votes will put Trump in the White House! Image retrieved via correspondence sent by Progressive Turnout Project, fair use. Okay, so Jennifer Lawrence. Kat and I actually discussed her in one of our first Culture War Correspondences ever, back when the actress [or actor, I haven’t decided how I feel about the term being gender neutral] and the positive attention she was garnering online was creating an equal if not greater amount of backlash. However these days people aren’t talking about how much she loves food or her general sense of coordination when walking up to receive an Oscar. I don’t own a smart phone, and as a result I do not have Candy Crush Saga. I own a dinky little Samsung slider phone which is complete with six game demos, from WPT Hold ‘Em 2 to The Sims 2. My all-time favourite is Block Breaker 2, and I can’t count the number of times I’ve broken those blocks on the only available level over and over and over again. I’m easy to please, is what I’m saying. Also that I’m not in the target demographic here. Many of my friends are, though; their enthusiasm for this confectionery-based game has seemingly no bounds. I get it, too- puzzle games are fun. Puzzle games that feature the too-sweet treats that you ideally want in your mouth doubly so. 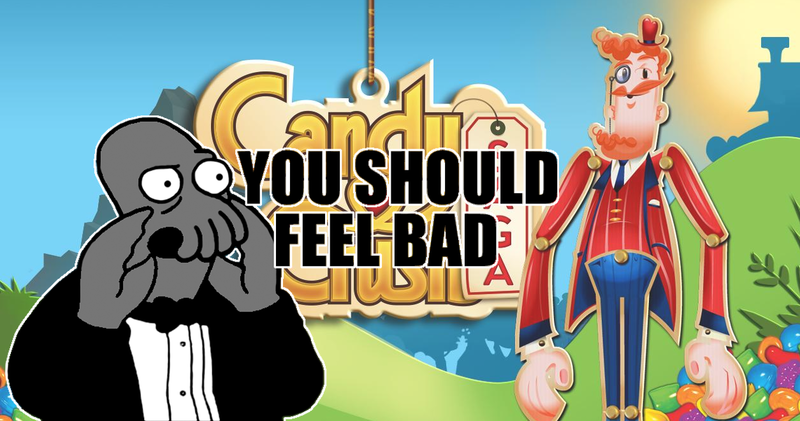 I don’t personally have anything against smart phone games candy-based or otherwise, what I have a problem with is greed and theft. Everyone remember when this happened? Do you remember how it was followed by a whole lot of this?